Without it, you can end up with a flat, lifeless pancake that looks too much like a lost crepe. 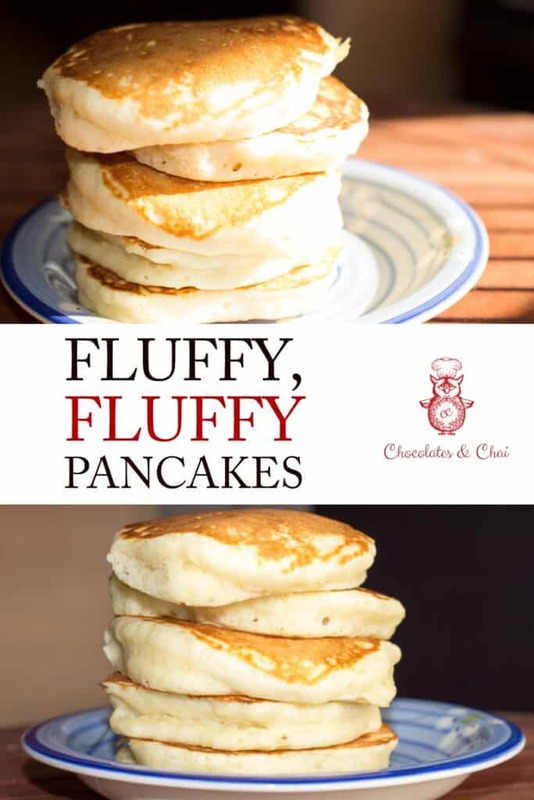 Here’s a quick and easy recipe to make super fluffy pancakes with ingredients you probably already have at home. Never buy that horrid box of premix again. Please. This is what moody pancakes look like. In short, yes. This pancake recipe uses no buttermilk at all (it does require regular milk though). So, you may ask, what’s the deal with buttermilk? Well, it’s terribly in vogue when it comes to baking. And there’s a reason for it. 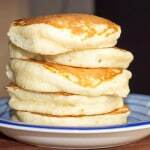 The acidity in buttermilk helps the pancakes rise. On the flip side, I’ve never known anyone to regularly stock up on buttermilk. In fact, until I moved to Canada, I had never even seen buttermilk… not even at a supermarket! Now, if you do happen to have buttermilk, you can give this Blueberry Buttermilk Pancakes recipe a shot! Sifting flour is a beautiful thing. It’s like making snow fall… And then turning it into a cake. 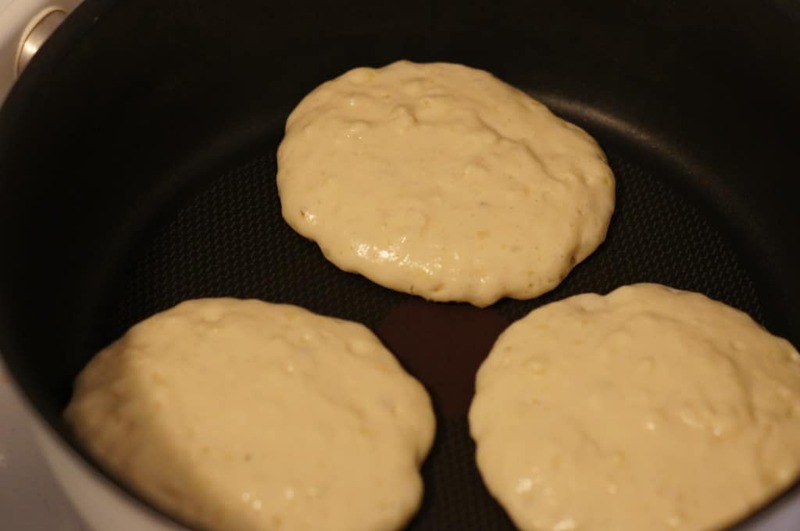 Overmixing your batter – overmixing your pancake batter will deflate a lot of the air bubbles in your batter, making it difficult for your pancakes to rise into the light and fluffy pancakes you want (the video in my recipe section is an example of this!). Secondly, it’ll develop gluten. And too much gluten will result in a tough, chewy pancake. Stale Baking Powder – baking powder typically has a shelf life of 9 months to a year. 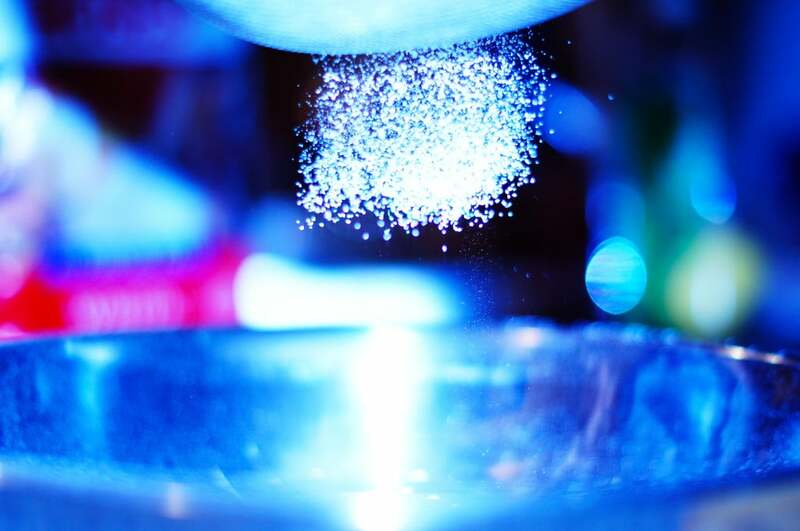 To check whether your baking powder is still fresh, simply stir half a teaspoon of baking powder into a cup of water. If you see an immediate reaction (it’ll fizz up, bestie! ), then it’s still good to use. If not, you should consider replacing it. Humid Conditions – This is based on an observation made by many of my readers (you can see it mentioned in the comments section below). But a very humid kitchen results in a runnier batter, which means less fluffy pancakes. If you happen to be in a place that is very humid, try putting your batter in the fridge for 10-15 minutes to make sure it doesn’t become too fluid/runny. 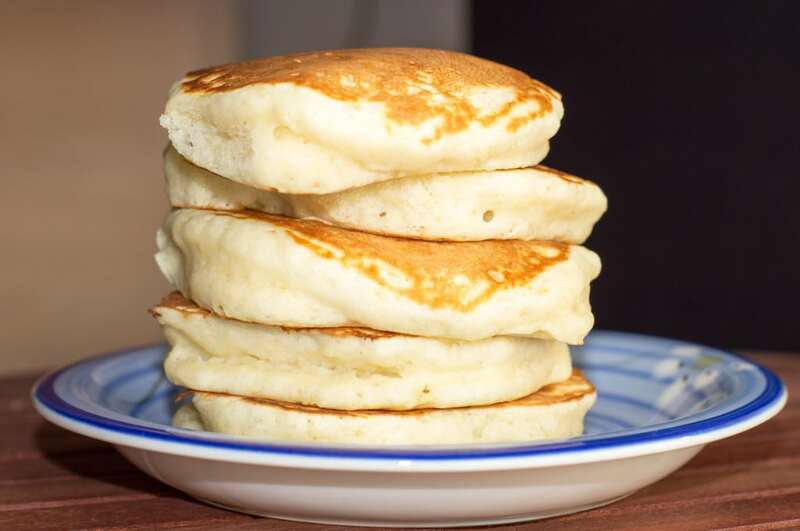 Not Letting Your Batter Rest – Letting your batter rest before cooking allows the starch granules in the flour to expand resulting in an airier pancake. The Violent Flip – Turn the pancakes over gently. Flipping them high into the air results in the air literally being squished out of them! Also…make sure to relax, bestie. Making pancakes should be a pleasurable experience! And this fluffy pancake recipe is simple; it doesn’t require any fancy steps (like whipping egg whites into a meringue). Be mindful of the tips above, and pay attention to your heat management, and you’re sure to be fine. Of course, if you do end up burning your first pancake, just remember what they say: “Le première crepe est pour les chiens!” (A French saying meaning, “The first crepe is for the dogs!”). The faster you cook, the sooner you eat! Here are three other amazing pancake recipes that don’t require any buttermilk at all. Each one is unique, and delicious! Lemon Mascarpone Pancakes – perfect for days when you’re looking to impress with an elegant pancake recipe. Lemon Raspberry Dutch Baby Pancake – this is the pancake you serve when you want everyone to spend the first 5 minutes of the meal taking photos of the food. 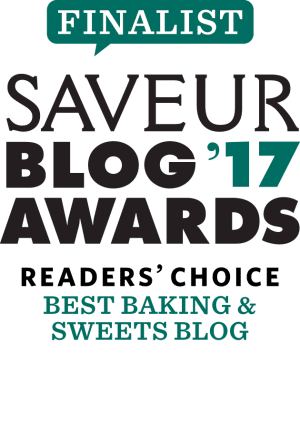 Dutch Baby Pancake – a pancake with a twist! Quick and simple to make. Maple syrup over a pat of butter. Yes, please! 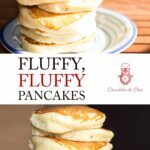 If you’ve been visiting my blog for a while, you may realise that this is a republished version of one of my very early blog posts (also titled, “Fluffy, Fluffy Pancakes”, originally published: February 17th 2015). I’ve updated the post quite significantly. 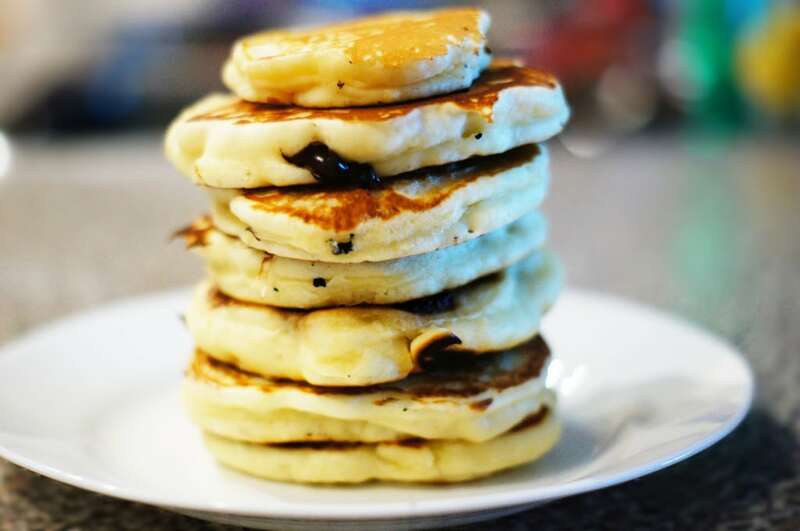 While the recipe is the same great pancake recipe it’s always been, I’ve rewritten the post with the aims of addressing some of the major questions I’ve received from commenters over the last few years. If there’s anything you feel is still missing, please do let me know with a comment below. Heads up! The following are affiliate links. If you buy something through one of these links, I will receive a small commission. You won’t need to pay a penny more, but it’ll help keep my lights on! Thank you bestie, you rock! Luckily, it doesn’t take much equipment to make perfect pancakes. It is however a lovely feeling to have all the right equipment. 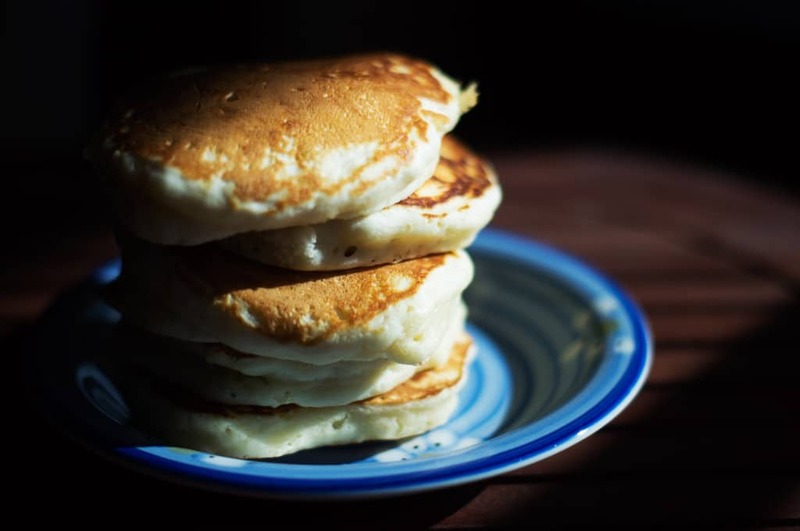 Here are a few little things that might make your pancake-making experience just that much sweeter. Silver Dollar Pancake Pan – if you want your pancakes to all look exactly the same. Zwilling J.A. Henckels Marquina Non-Stick Frying Pan – a good pan is crucial to properly cooking pancakes, and this one is sure to please. OR…(and this is super exciting, bestie) how’s about you check out The Chocolates & Chai Shop? The shop is a place for fashionable foodies, providing all sorts of apparel including the very relevant Pancake Time t-shirt below! While I’ve still got your attention, please do take a moment to follow me on Facebook, Instagram, Twitter, Pinterest, and YouTube. Or you can subscribe to my mailing list – don’t worry, I’ll never give out your information or send you any spam. Thank you, bestie! It’s easy to add chocolate chips, just fold a few handfuls into your batter (but for maximum fluffiness, you’ll gently place them into the pancake as it cooks!). Mmm… look at that delicious chocolate! Haha, that’s amazing Daiva!! You ARE a pancake master! I hope you check out a few other recipes, and then you can impress everyone all over again! Very Nice pancake, I do mini pankcake and my family loved it. Why milk 3/4 cup plus 2 tbsp , 2 tbsp every time ×2 ×3. Hey Fahad! Thanks for commenting, I’m glad you enjoyed it! I think that’s actually an error from the recipe multiplication plugin/software that I’m using. I’ll drop the support team a note to let them know that happens, and hopefully they’ll fix it super quick. Thanks for letting me know! I love this recipe. I make pancakes all of the time, and this have been my favorite recipe. I’m so happy to hear that!! Thanks for commenting Ashley! Hey Mary! Yes…though I don’t know how ratios would change by using self rising flour and removing the baking powder. 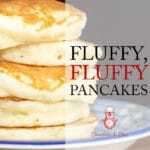 But I presume you’d still get fluffy pancakes!